In Robert Hughes’ The Mona Lisa Curse, there is a thoughtful exchange between Hughes and painter Sean Scully. Their brief conversation touches on many of the distinctions I have been writing about here over the years. These two polarities are in opposition says Scully. Art that is interactive can be striking and dramatic, but that comes at a great cost. Art is a place to to go, not an escape into entertainment. You can view the Hughes/Scully video clip here. Deborah – I watched this clip earlier and liked it a lot, too. I think there must also be the persistent slowness of the viewer’s eye to return again and again to a painting, always finding a part not quite remembered or amazingly seen for the first time after looking so many times before. This “deep vision” is something I seek in my own work both in the making and in the viewing afterwards. P.S. 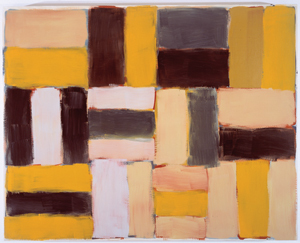 I really like Sean Scully’s work a lot. Thanks for posting. Nancy, that’s it for me too. Thanks for your words. I wonder — in an era of “continuous partial attention” — how many people will even make or take the time to really look at or into a painting. Visit a museum and watch people race past the art and wonder why they are there. I love how a terrific piece draws you in and you can return to it, but this is becoming increasingly unlikely in a culture of speed and haste, no? Great phrase–continuous partial attention. Many have written about that issue in regards to novel reading, but less gets spoken about its impact on experiencing art. Thanks so much for this comment. I had the privilege of seeing a marvelous show of Scully’s work at the Phillips and of hearing him speak about his art. I’m totally drawn to his work, not the least because it so rewards time spent looking, whether the looking is for the first time for a long time or repeated viewing.